My boys and I are currently on holidays down in Victoria with our family, so in the lead up to our trip I was madly baking to create a few recipes for the blog whilst we are away. 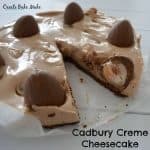 The day before our trip, I had an extra early start to get this Cadbury Creme Egg Cheesecake into the fridge before the boys woke up – because let’s be honest, as soon as they saw chocolate in my mixing bowl they would want to lick the spoon and even in our chocolate filled house 7am is waaaay too early! It took every ounce of my self control not to have a sneaky taste of this cheesecake while I was making it, unfortunately the same can’t be said once this cheesecake had set. Even though I’m not a huge fan of Cadbury Creme Eggs (I’m a caramel and malteser egg kind of girl), I couldn’t help myself but sit down and sneak a small piece of this cheesecake when I should have been packing instead! If you like this Cadbury Creme Egg Cheesecake Recipe, make sure you check out my 3 Ingredient Cadbury Creme Egg Fudge Recipe! Also you can find ALL of my Cadbury Creme Egg recipes in this post. If you love Cadbury Creme Eggs, This easy no bake Cadbury Creme Egg Cheesecake will certainly be the ULTIMATE Easter dessert! Line the base of a 22cm spring tin with baking paper and lightly grease the sides before setting it aside until needed. Crush the chocolate ripple biscuits (or similar) using a food processor or a rolling pin until the resemble breadcrumbs. Add the melted butter and stir until combined. Pour the biscuit mixture into your prepared tin and using a large metal spoon cover the base with and flatten the surface. Meanwhile, break the milk chocolate into small pieces and place it in a microwave safe bowl. Cook for 30 second spurts (stirring in between each cook) until the chocolate has almost melted. Remove from the microwave and continue to stir until the chocolate has completely melted. Add the melted chocolate to the cream cheese mixture and mix on a medium speed to combine. Remove the mixer bowl from the stand and add 1 packet of mini cadbury creme easter eggs and gently stir them through. Pour the cheesecake mixture over the biscuit base and use a spatula to make sure it evenly covers the base. 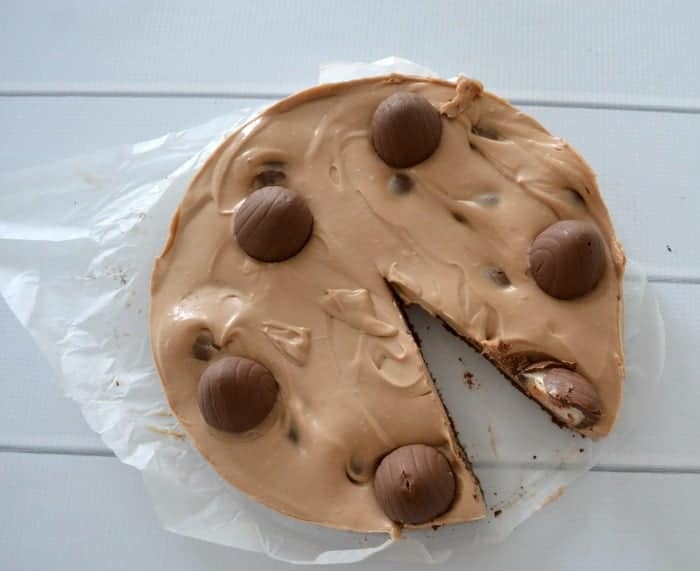 Use the remaining large cadbury creme easter eggs to decorate the top of the cheesecake. Remove the set cheesecake from the fridge and cut into slices to serve. 1. Line the base of a 22cm springform tin with baking paper and lightly grease the sides. Set aside until needed. 2. Cut the butter in half and place into your Thermomix bowl. Cook for 2 minutes on 60 degrees speed 3 or until melted. 3. Add the chocolate ripple biscuits and mix for 10 seconds on speed 9. Use a spatula to scrape down the sides and mix again for another 10 seconds on speed 7. 4. Pour the biscuit mixture into the prepared tin and use a large metal spoon to cover the base with the biscuit mixture and flatten the surface. 5. Place the milk chocolate into a clean Thermomix bowl and blitz for 10 seconds on speed 7 before cooking for 3 minutes, 60 degrees, speed 2 or until the chocolate has melted. 6. Add the vanilla extract, cream cheese, cream and caster sugar to the Thermomix bowl and mix for 30 seconds on speed 5. Scrape down the sides and mix for another 3o seconds on speed 5. 7. Add the small Cadbury Creme Eggs to the Thermomix bowl and mix for 20 seconds on reverse speed 2. 8. 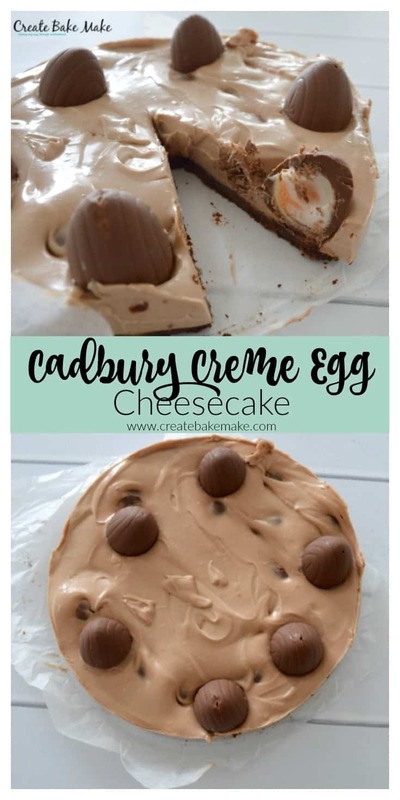 Pour the cheesecake mixture over the biscuit base and top with the large Cadbury Creme Eggs. 9. Place in the fridge to set. Ideally you want to leave this overnight, but is should be ok after 4 hours. 10. Remove the set cheesecake from the fridge and serve. The above mixing times may vary depending on the softness of your cream cheese. I suggest using cream cheese which is at room temperature. For more great no bake recipes, check out our best selling ‘No Bake Bars and Slices’ also available in a Thermomix version. 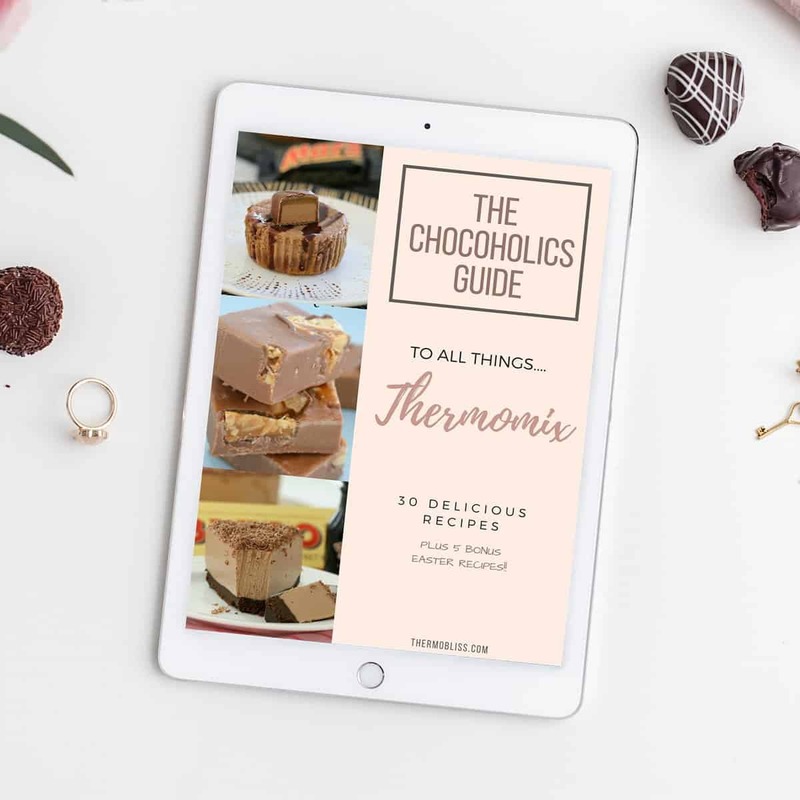 You can browse all of our ebooks (including our Thermomix Chocolate ebook) and printed books here. Oh me oh my! Wow. I might have to give this a go. Delish! Does it get any better?! I’m moving to QLD just so you can make me this lol!!!! Wow, this looks seriously delicious. I’ve only made one cheesecake before but I’d love to give this creamy Easter concoction a go. Yum! What a perfect Easter cake! Sounds absolutely delicious! Oh wow that just looks devilishly delicious! What a great cake for Easter! Ooh that sounds like a fabulous idea! 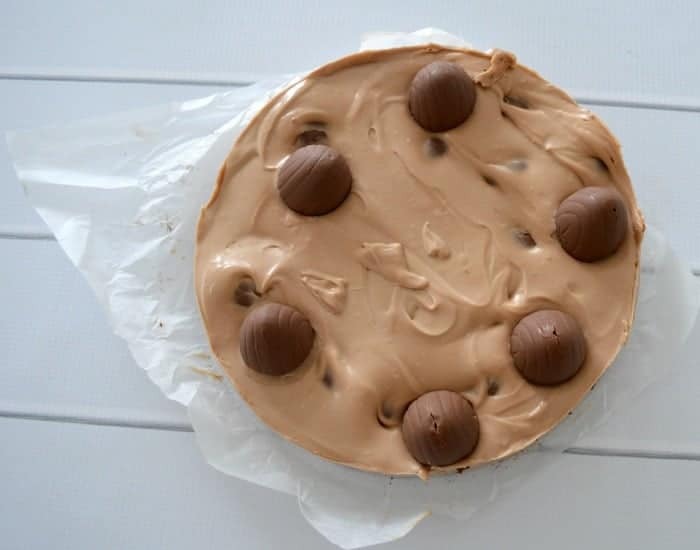 It’s such a versatile recipe, I’ve made it using Maltesers, Mars Bars and am thinking Caramel Eggs might be a good idea too! I’d love to hear how you go!